Pro Series Hunting flashlight with Green LED 3W 250 Lumen - Full Size Flashlight with High/ Low Intensity and Strobe Features. With rail mount. Green LED flashlight output is designed to not spook some Game animals at night, yet allows the user to see in the dark. 3 Watt Bright Green CREE® LED, 250 Lumen max output. Custom two-way steel pocket clip, can be clipped onto clothing in either direction/orientation. Push Button Rubber On/Off switch. 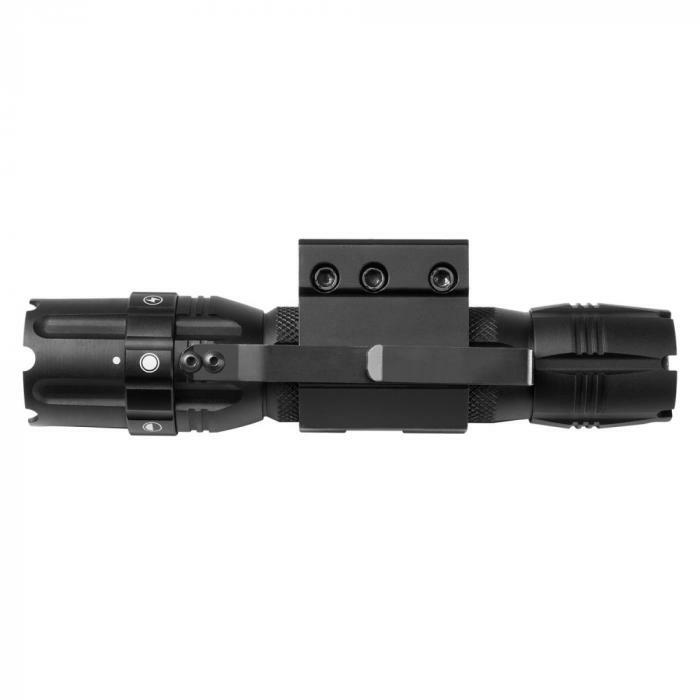 Includes removable rail mount that will fit Weaver/ Picatinny/ MIL-STD 1913 type rails. Flashlight central body diameter is 1", making it compatible with most 1" flashlight type mounts. Tailcap Body factory machined for a lanyard (not included).